Where are they? 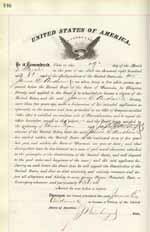 Finding Your Ancestors' US Naturalization Records? Looking for an ancestor who immigrated to the United States? Naturalization records can provide the best documentation of where and when someone came into the country, as well as where they were coming from. But if you've ever tried to find one of these little goldmines, you know that it's not always easy to find them. MyTrees.com has teamed up with Fold3.com to bring you a 3.6 million name index of naturalization records. Click here to search the index. If you have searched the MyTrees.com Naturalization Index yet still are unable to find your immigrant ancestor's naturalization records, perhaps the following article will help you to determine where the record might be or if it exists at all. Here is a brief history of naturalization laws and some ideas on how to navigate those clandestine depositories of naturalization records. The Constitution of the United States gave Congress the power "to establish a uniform rule of naturalization", and Congress wasted little time in making such laws. The first federal naturalization law was passed in 1790, and then modified in 1795 and 1798. A new law in 1802 established the basic guidelines that were in effect until 1952. The major requirements of this law were that an applicant reside 5 years in the United States and one year in the state where he naturalized. He was to have filed a Declaration of Intent at least 3 years before admission as a citizen. The applicant was to be of good moral character, take an oath of allegiance, renounce any title of nobility, and forswear allegiance to any reigning foreign sovereign. Though Congress provided that there were certain requirements for a given court to be able to naturalize a citizen, in practice, most states determined which of their courts could exercise this authority and commonly there was one court designated in each county to handle naturalization procedures. That court might have been the circuit, district, common pleas, chancery, probate, superior or any other court so designated. Frankly, this makes it pretty confusing for a genealogist to figure out just where to find a naturalization record. By the end of the 1800s, the naturalization process was being misused, and even abused in some areas. So Congress passed changes to the naturalization procedures in 1906 and created the Bureau of Immigration and Naturalization to oversee the process. This Bureau provided for a uniform rule for the naturalization of aliens throughout the country. The rule required that naturalizations could only be done using the blank forms and records provided exclusively by the Bureau. With this simple procedure, the Bureau controlled which courts were permitted to naturalize immigrants. That supervision proved effective. The 1905 Presidential Commission on Naturalization found that 5,160 courts were, or had been, naturalizing aliens. By 1908, only 2,244 courts were authorized. This at least cut the options down to less than half of what it had been. A useful listing of the courts permitted to naturalize is "A Directory of Courts Having Jurisdiction in Naturalization Proceedings" issued by the Justice Department in 1963. This directory indicates the status (active, inactive, never active, etc.) and indicates which courts assumed jurisdiction for those who were no longer naturalizing. It is available on microfilm through Family History Centers. Over time, especially after 1929, the control shifted to the federal courts, and fewer state courts were permitted to naturalize. However, even after this date some state courts were permitted to naturalize, while some federal courts never exercised the function. An immigrant may not have remembered exactly when he or she arrived (although arrivals after 1906 received a certificate of arrival that was presented to the court when the Declaration of Intent was filed). Sometimes a nearby large city or last residence may be named as the birth place. Generally however, the information on these records was correct. Clearly, an immigrant did not want to risk being denied citizenship by providing false information. Much of the information genealogists seek can be found on scanned images at Fold3.com Another genealogical site which may have some scanned natualization images is Ancestry.com. Using the Family History Library Catalog at FamilySearch.org. can help you locate other films which are available through interlibrary loan. Why Can't I Find My Immigrant? Naturalization were not required. While non-citizens might be restricted from some activities (notably voting, and in some cases, land ownership), many immigrants could very well live a full life in America without becoming a citizen. Some immigrants did not intend to remain in America. Many came to work and intended to go back to their homeland. With the requirement of a five-year residence, some immigrants did not live long enough to become citizens, or just never got around to taking care of it. Until 1922, married women were not required to become naturalized separately. Minor children were not required to become naturalized, if their parent was naturalized before they turned 21 years old. Since 1934, immigrants under 21 years of age are considered citizens after five years residence, without any paperwork. Even children whose parents did not naturalize could, themselves, become naturalized without making a separate Declaration of Intent. On the other hand, the naturalization applications since 1906 have required the names and birth information of the wife and children of the applicants. This can help you pick up the entire family if one person did naturalize. So the focus for your work is to determine which ancestor (usually a male, head of family) likely went through the process, as the records will be in his name. In some situations, there may be separate documents available related to the other family members. For example, if a man arrived as a minor and later claimed derivative citizenship based on his widowed mother's naturalization, it could take place as late as when he was 20 1/2 years old (and therefore still a minor). In order to document his citizenship status, he filed an "Application for Certificate of Derivative Citizenship" with the Immigration and Naturalization Service. 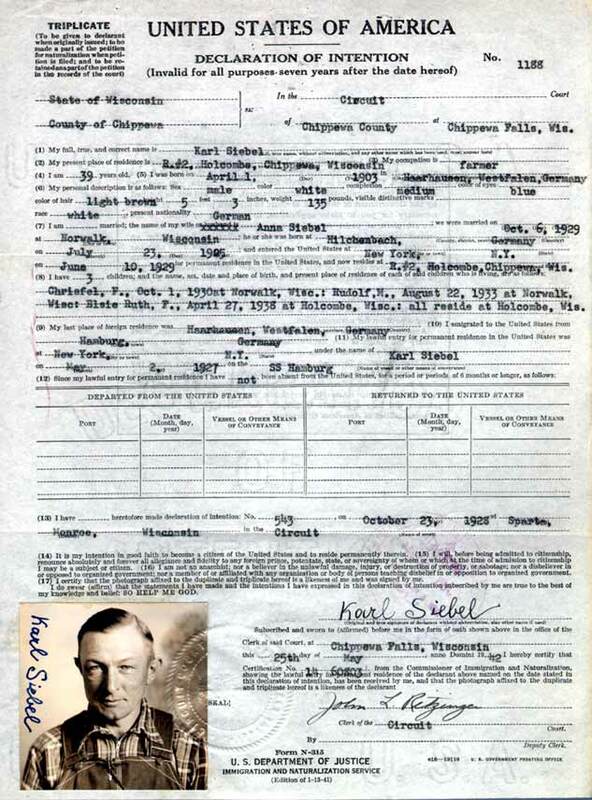 While such documents were not required, and not even created until 1929, they provide excellent detail about his and his parents' births, immigration information (including related travelers and to whom they were coming), a physical description, and even his then current employment. There are some unique challenges associated with researching women immigrants. As noted above, until 1922 married women were not required to be naturalized separately from their husbands. But the story of women and naturalization records is far more complex than that. Before 1922, women generally became citizens only when their husbands or fathers naturalized (or when they married a US citizen). However, there were cases of women, particularly single adult women, being granted citizenship in their own right. Remember that before the creation of the Bureau of Immigration and Naturalization in 1906, there was a great deal of confusion about the naturalization process. There were no strict federal standards and individual county courts were left to provide their own interpretations of naturalization laws. So, some courts may have granted the petitions of women to naturalize, while others did not. 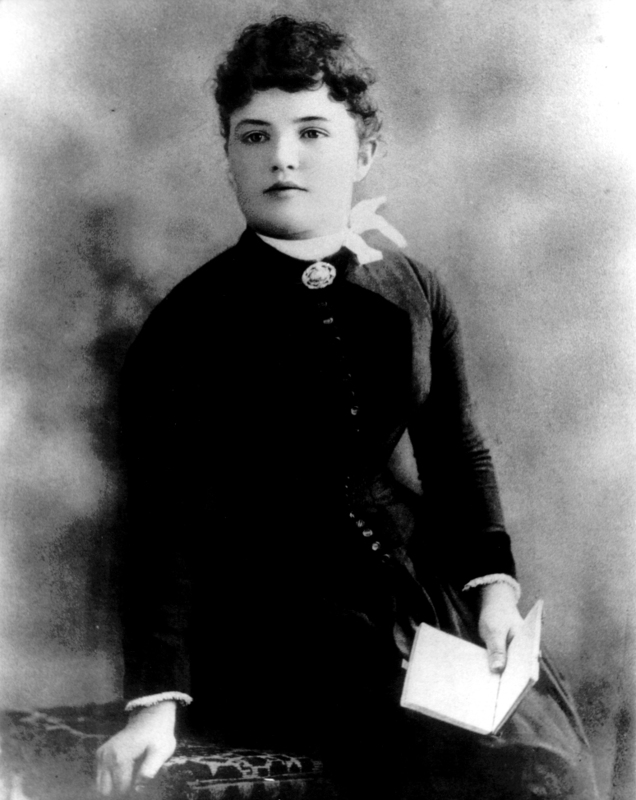 An act passed in 1907 stated that a woman's nationality depended entirely on her husband's. This meant that if her husband gained citizenship, so did she. It also meant that if a woman who had been born a US citizen married an alien, she lost her citizenship. She could repatriate only if and when her husband naturalized. In an article titled Women and Naturalization, Marian L. Smith discusses how women's right to be naturalized was affected by their right to vote. As some states began to grant women the right to vote, some men began to find that their petitions for naturalization were denied because their wives were not eligible (for example, if their wife was unable to speak English.) In 1922, Congress passed the Married Women's Act, which separated a woman's nationality from her husband's. So, if you are searching for a female ancestor, you may or may not find naturalization records for her. There would most likely not be records pre-1922, but it's possible. Generally, before that time a woman's proof of citizenship was her marriage record and her husband's naturalization certificate. 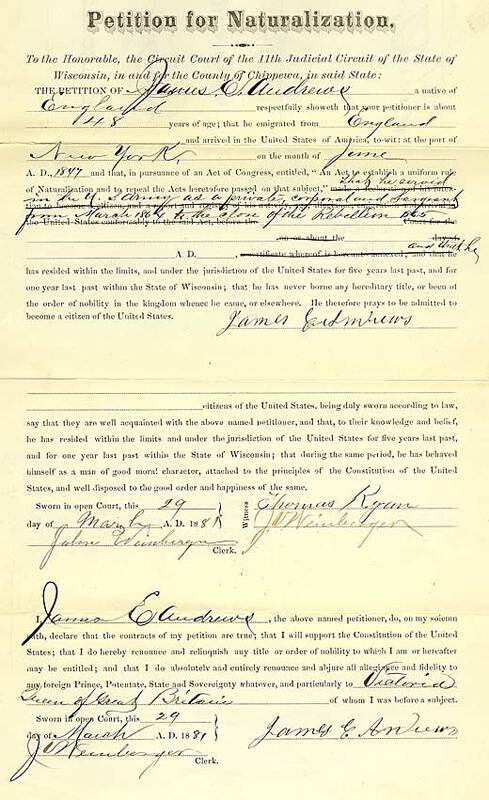 After the standardization of records in 1906, a woman's name will at least appear on her husband's petition (it may appear on records prior to that time, but not all courts required it). After 1922, you can confidently assume that if your female ancestor became a citizen, she had to petition in her own name. "Na" for those who had completed their naturalization. Do not misinterpret the year, which is listed on the census after the naturalization status. That is the year of immigration, not the year of naturalization. Obviously, if an immigrant shows "Na" in the 1900 census, you will probably not be seeking the new, post-1906 naturalization documents. 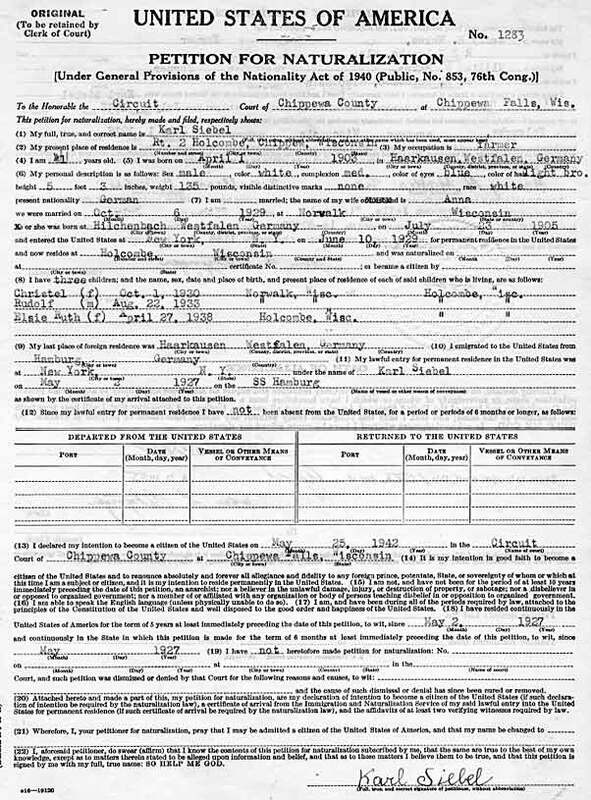 Continue searching the 1910, 1920, and 1930 census records for the immigrant and their immediate family members. The 1910 census asks the same questions and uses the same abbreviations. In 1920, the census records the year of naturalization as well as the year of immigration -- a great boon to research. In 1930, immigrants were also asked what language they spoke before coming to the United States. If an ancestor was born in Estonia, but indicated that he spoke Croatian, it could provide a clue to his parental heritage. Be aware, however, that the information on census records may not be completely accurate, especially regarding dates many years previous. The citizenship status, however, is usually correct. By obtaining several records to document the event, the truth eventually comes out. Once you have learned that an immigrant was naturalized after 1906, your goal becomes obtaining the naturalization documents. Begin by searching indices for the courts where the immigrant lived the majority of his adult life. Start with the local courts, unless the naturalization took place after about 1930 when you would go directly to the Federal agency. the state archives (or historical society) may have obtained them. the Family History Library in Salt Lake and its system of Family History Centers has many state court naturalization records available on microfilm. You will also want to check the records of federal courts. Determine which federal court had jurisdiction for the area where the immigrant lived. Contact that court to learn if they still have the naturalization records, and if they have maintained an index. Many federal court records have been gathered to the National Archives Field Offices, so you may need to write to the regional archives, or travel there. Many of those records have also been microfilmed by the Family History Library as well, which means they may be sent via interlibrary loan to a local Family History Center in your area. 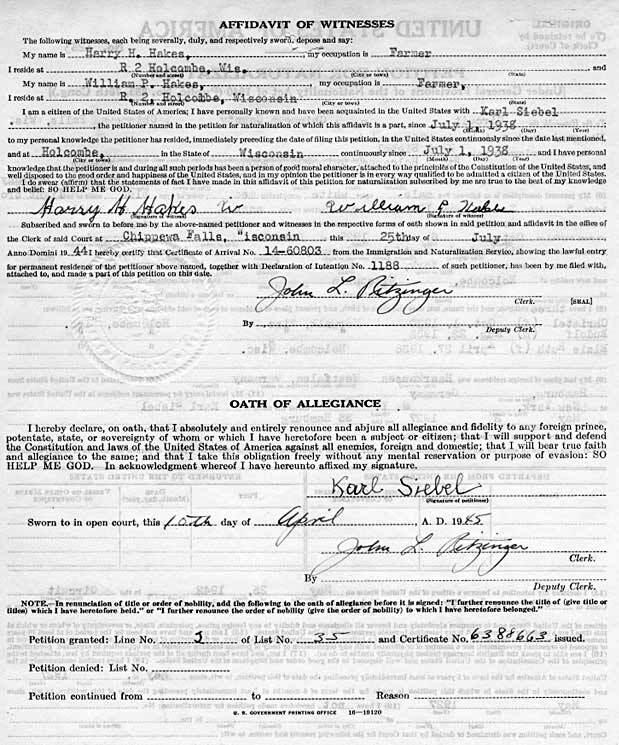 The WPA created several indices to naturalization records during the 1930s. Often these include pre- and post-1906 naturalizations, and may include state as well as federal records. These indices often coincide with the jurisdiction of the regional branches of the National Archives. So, for example, the Boston area archives has an excellent index to New England naturalization records. In fact, the Family History Library has the best collection of naturalization records in the county. Most of the films they have made of federal records simply are not available at or through the National Archives (although copies will be at the regional archives where the filming was done). Therefore, a trip to your local Family History Center may be one of the best places to begin your search. Examine the Family History Library Catalog for the localities of interest under the heading "Naturalization and Citizenship." This article covers the basic foundation of information on naturalization records and where the original documents may have been filed. We hope you will find it helpful in locating the naturalization records of your immigrant ancestors! Karen Clifford is a well-known professional genealogist and owner of one of the largest genealogical research companies in Utah, Genealogy Research Associates. Illustrations provided by Aubrey Frederickson. Copyright © 2009-2018 Karen Clifford. All rights reserved. products and services. The affiliate commissions that are generated from these ads help us to keep our subscription prices low.